This designer non-air gap faucet from GAPPO is designed for dispensing water from a reverse osmosis system or a water filtration unit that does not require a drain connection with an air gap. 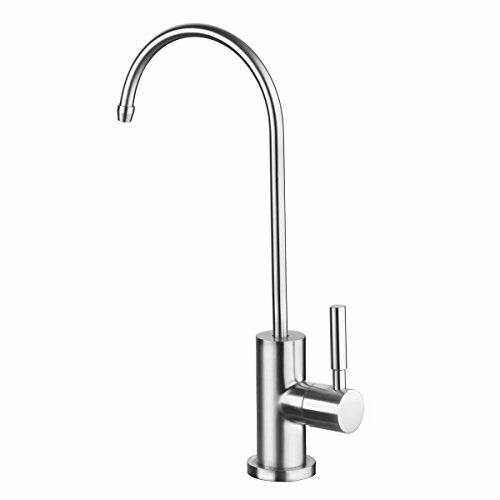 It features a brushed stainless steel finish, smooth-operating ceramic disk element, lever-style handle, high-reach design and swivel neck. Installation is easy with any RO filtration system that uses 1/4" PE water tubing. Main body material: 304 Stainless Steel. 1. High water pressure test for each faucet ensure leakproofness and durability. 2. User-friendly Installation, mostly by hand only except screwing hose to angel valve by wrench. 3. 100% Money Back Guarantee within 90 days . DRINKING WATER FAUCET：Lead-Free, safety and healthy guaranteed.Standard non air gap faucet. STURDY HANDLE：Lever-style handle, high-reach design and 180 degree swivel neck. SPOUT：The tall spout has a high-arc that is ideal for pouring drinking water. MATERIAL：Durable and reliable stainless steel construction, brushed nickel finished. DETAILED SIZE：Overall Height: 11.22 inch, Spout Height: 8.66 inch, Spout Reach: 5.70 inch, Standard 1/4" and 1/2" connection. If you have any questions about this product by GAPPO, contact us by completing and submitting the form below. If you are looking for a specif part number, please include it with your message.